New York (CNN) US Ambassador to the United Nations Nikki Haley said the United States was prepared to sustain its pressure on Syria after a night of military strikes meant to cripple the country’s ability to use chemical weapons, as Russia accused Washington of “hooliganism” and a major breach of international law. “We cannot stand by and let Russia trash every international norm that we stand for, and allow the use of chemical weapons to go unanswered,” Haley told the Council. “An aggression of a sovereign state was carried out, which is on the front line of the fight against terrorism,” Nebenzia said. As the two sides traded barbs, UN Secretary General Antonio Guterres urged an end to military action and a turn to diplomacy. A draft resolution introduced by Russia condemning the strikes was defeated, with eight countries opposing it, four abstaining, and three — Russia, Bolivia and China — voting in support. The French and British ambassadors to the UN proposed conditions that could allow for a negotiated end to the conflict, which has raged since March 2011, with French Ambassador Francois Delattre directly asking Russia to cooperate. France asks “Russia to call on Damascus to enter a negotiated solution,” Delattre said. “Her country, is ready, is ‘locked and loaded,'” said ambassador Sacha Sergio Llorenty Soliz. “Of course, we clearly heard her words with a great deal of concern and a great deal of sadness. We know that the United States has aircraft carriers, that they have satellites, that they have ‘intelligent missiles, smart bombs,’ they have a huge arsenal of nuclear weapons. The US, UK and France launched coordinated strikes against three Syrian sites in retaliation for the an alleged chemical weapons attack on civilians in the last rebel stronghold of Douma, leaving at least 49 people dead. Images of children gasping for air shocked the world and galvanized the White House. “I ordered the United States armed forces to launch precision strikes on targets associated with the chemical weapon capabilities of Syrian dictator of Bashar al-Assad,” US President Donald Trump said late Friday at the White House. As he spoke, witnesses in the Middle East said they heard explosions in Damascus, and photographs showed missiles streaking over the Syrian night sky. The allies struck a scientific research center located in the greater Damascus area, and two sites near Homs. US Defense Secretary James Mattis said “right now this is a one-time shot and I believe that it sent a very strong message” to the Syrian regime. While Haley focused on themes of Russian obstructionism and American resolve to strike as needed, the British and French ambassadors emphasized an interest in pursuing talks to ease tensions. Syria’s chemical weapons program must be ended and its chemical weapons stockpiles destroyed once and for all. There must be an immediate cessation of hostilities, in compliance with all Security Council resolutions. Syria must return to so-called Geneva peace talks and agree to a substantial agenda put forward by the UN Special Envoy. There must be accountability for the use of chemical weapons and other war crimes. Delattre, the French ambassador, added that the destruction of Syria’s chemical program has to happen in a “verifiable and irreversible” way. They included the defeat of ISIS, a ceasefire throughout Syrian territory with “full and unfettered” humanitarian access, and a crisis exit strategy that incorporates a lasting political solution. 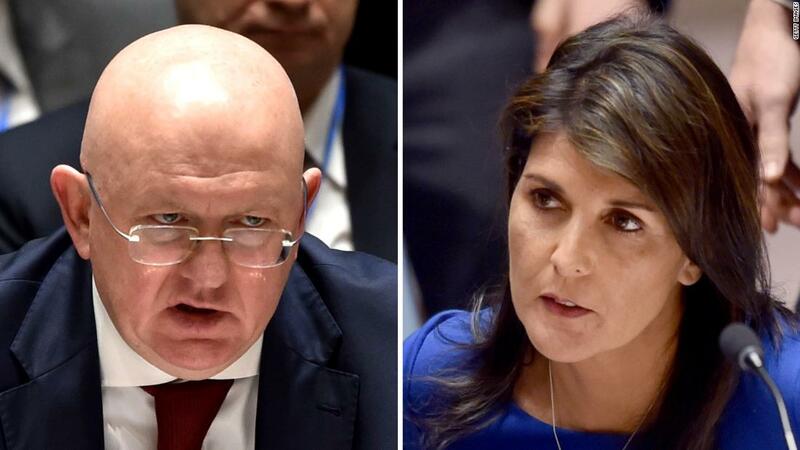 But Nebenzia maintained the Russian argument that the US and its allies had “used as a pretext a staged chemical attack” in order to target Syria. He claimed that “Russian military experts did not find any trace of” chemical weapons at the site, which is now under the control of the Syrian regime. Haley, who spoke after the Russian, was dismissive. “We can all see that a Russian disinformation campaign is in full force this morning, but Russia’s desperate attempts at deflection cannot change the facts,” she said. The attack, she said, was justified and based on facts. “A large body of information indicates that the Syrian regime used chemical weapons in Douma on April 7th,” Haley said. “There is clear information demonstrating Assad’s culpability,” she said. Haley pointed to Russia’s six vetoes in the Security Council to protect Syria from condemnation or resolutions meant to address chemical weapons, as well as its move in November to shut down a UN body created to investigate chemical weapons attacks in Syria. Those acts have made Moscow complicit in the abuses the Syrian regime has conducted against its own people, she said. Haley promised the US would stand ready to act again. Nebenzia, speaking to reporters after the meeting, said he was “very concerned” that the Syria strikes had created a “dangerous” political and military situation. He added that the situation wasn’t conducive to any kind of rapprochement with the US. “I hope the hotheads will cool down and that will be it, and we can rebuild what was destroyed,” he said.